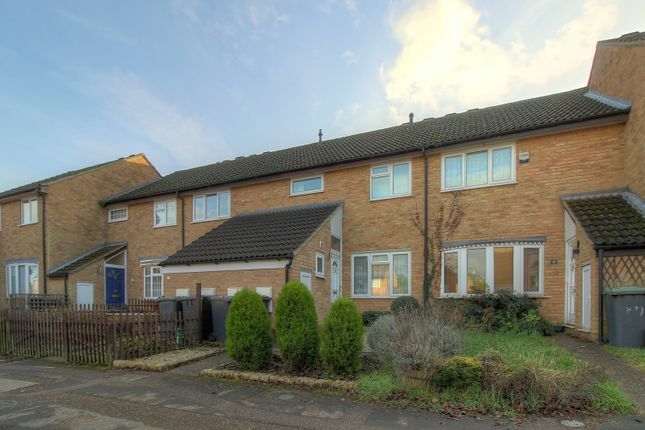 A nicely presented three-bedroom mid terraced house, much improved by the present owner and situated in a cul-de-sac, located at the 'Church End' of Arlesey. 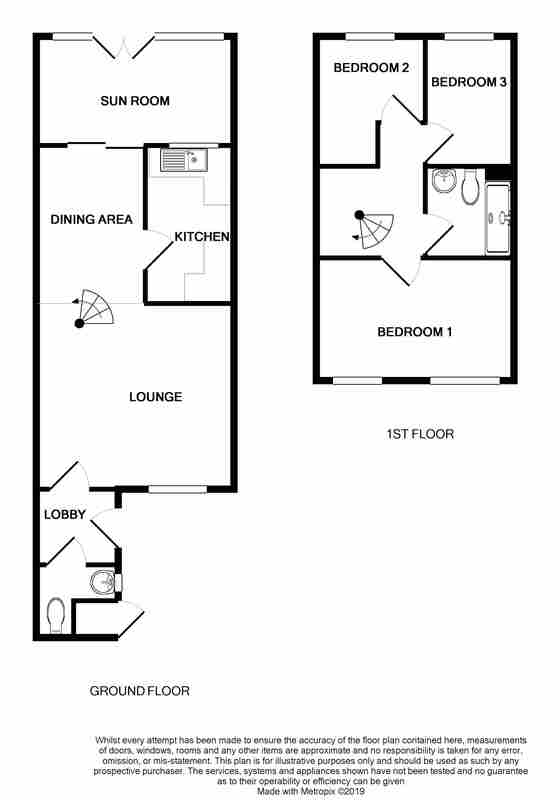 The accommodation has been altered to now comprise: Entrance porch, downstairs cloakroom, open plan lounge/diner, modern fitted kitchen, sun room and on the first floor: Three bedrooms and shower room. Outside there is a well maintained enclosed sunny rear garden, small front garden and garage situated en-bloc with parking to the front. This is an attractive property and viewing is therefore highly recommended! Double glazed door to front, opening into the entrance porch. Double glazed window to side, suite comprising wash hand basin with cabinet under, low flush toilet, radiator, inset ceiling lights, tiled flooring. Lounge area: 3.89m x 4.15m (12’9 x 13’7) Double glazed window to front. Radiator. Spiral staircase to first floor, wood laminate flooring, opening to dining area. 3.26m x 2.25m (10’8 x 7’4) Double glazed sliding patio doors opening into sun room. Fitted dresser to remain, radiator, wood laminate flooring, door to Kitchen. 3.26m x 1.83m (10’8 x 6’0). Double glazed window to rear. Modern fitted kitchen comprising a matching range of wall and base units with work surface incorporating an in-top stainless-steel sink with mixer tap, dishwasher, gas oven, fridge/freezer to remain. Tiled flooring. 2.25m x 4.05m (7’4 x 13’3). Two double glazed windows to rear. French doors opening out to garden. 2.53m x 4.15m (8’3 x 13’7). Two double glazed windows to front. Fitted wardrobes to remain including double bed. Radiator. 2.71m x 2.06m (8’10 x 6’9). Double glazed window to rear. Radiator. 2.69m x 2.04m (8’9 x 6’8). Double glazed window to rear. Radiator. A suite comprising double shower cubicle, wash hand basin with vanity unit under, heated towel radiator, extractor, low flush toilet. Open plan area laid to lawn with pathway to front door.